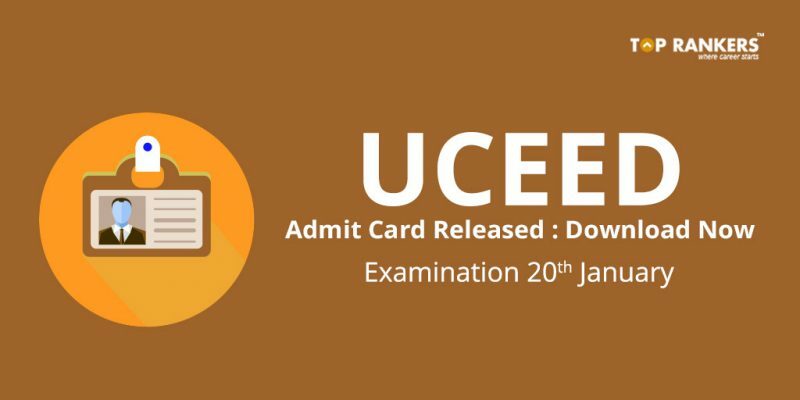 UCEED 2018 Admit card released by UCEED. Admit card can be downloaded from the official website in effect from 25th december 2017. Candidates whose registration is complete in all aspects will be able to download the admit card for UCEED 2018 from the registration portal https://uceedapp.iitb.ac.in from the date specified below. The admit card will bear the following details of the candidate: Name, UCEED registration ID, Roll Number for UCEED 2018, photograph, signature, examination schedule, examination centre details and instructions to candidates. Candidates should carefully examine the entries in the admit card and in case of any discrepancy, contact the Chairman JEE (Advanced), UCEED & CEED 2018 at IIT Bombay before the specified date via email mentioned in the registration portal. In case the admit card is not available for downloading, the candidate should contact the Chairman, JEE (Advanced), UCEED & CEED 2018 at IIT Bombay immediately via email or phone (See contact). Every effort will be made to complete the examination during the above Session. In the unlikely event of any technical problem in any of the exam centres, the exam may be conducted in the Reserve Session in the afternoon between 14:00 to 17:00, only for those candidates in the affected centres. Candidates appearing for UCEED 2018 are therefore advised to make their travel arrangements accordingly. In case the exam is conducted in the afternoon (reserve session), the question paper will be different from that of the morning session, but with the same number of questions, same total marks and with similar difficulty levels, which will be moderated for consistency and parity. Ability to detect concealed properties in ordinary things, people, situations, and events, and thinking critically about them. Applying attention to certain details, analysing, reasoning, classifying, inferring and predicting. Awareness of social and cultural connection with design, history of the designed artifact, and socially responsible and environmentally sustainable design responses. Ability to look at information, be it qualitative or quantitative in nature, and discern patterns within the information. Data Interpretation, brainteasers, and patterns. Ability to weigh opinions, arguments or solutions against appropriate criteria. Knows how to use logic and structured thinking to deduce from a short passage, which of a number of statements is the most accurate response to a posed question. Ability to understand and use Standard English. Reading comprehension, knowledge of English grammar such as sentence structure and usage, the use of tenses, verb patterns, articles, and active and passive constructions, etc. & vocabulary skills. Ability to distinguish innovative options and think out of the box. Ability to use visual analogies, metaphors, signs and symbols. Ability to understand complexity, identify problem, generate alternatives, evaluate options and select solutions. The candidate should have been born on or after October 1, 1993 if belonging to the OPEN or OBC-NCL category. The candidate should have been born on or after October 1, 1988 if belonging to the SC, ST or PwD category. If a qualifying examination Board awards only letter grades without providing information on the passing grade on the grade sheet, the candidate should obtain a certificate from the Board specifying the passing grade and upload it along with the grade sheet. In case such a certificate is not provided, the decision is taken by the Board. Decision of Admissions Committee will be final. The criteria, as specified above, is applicable to all the applicants including foreign nationals. Applications from foreign nationals including OCI (Overseas Citizen of India)/ PIO (People of Indian Origin) card holders are considered under the open category. they are outside the ambit of reservation of seats under the OBC-NCL, SC, ST and PwD categories. Seats allotted to foreign nationals are supernumerary. However seats allotted to OCI/PIO candidates are not supernumerary. All the best for your Exam. If you have any query or suggestion, Do write us in the comments below.